VIA Technologies has today introduced the Android PC system (APC) powered by WonderMedia ARM11 processor, with 512 MB RAM and 2MB Flash in a small Neo-ITX motherboard and that will sell for a mere 49 USD, slightly higher than the 35 USD Raspberry Pi. But whereas the Raspberry Pi would struggle to run Android with 256 MB, the APC has just enough memory top run Android 2.3 and Android 4.0. Another advantage is the presence of a VGA connector which is missing on the Raspberry Pi, as well as a few other connectors. 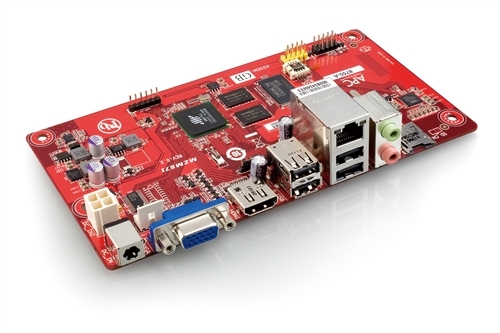 Beside the price, there are 2 “disadvantages” for this board compared to the Raspberry Pi. First, it will consume more power, whereas the Raspberry Pi can run from the USB power (max 2.5W). The second is that it’s much larger, I estimate about 3 Raspberry Pi could fit in the space occupied by the VIA APC. VIA will provide an optimized version of Android with video hardware acceleration for video formats such as h.264 and others. You will be able to stream YouTube videos (which AFAIK you can’t do with the Raspberry Pi) and watch 1080p HD videos. The WonderMedia also features a GPU for 2D/3D performance. You can watch the video below for a demo of the board with the compulsory Angry Birds demo, as well as Youtube video streaming and more. The VIA APC will be available in July 2012 for $49 USD, but you can register to be notified when pre-orders open now. 2nd Cpu can go up to 1ghz and 3rd it can be combined with mali200. The processor specs shows the video decoder supports 1080p. So it’s possible it can decode 1080p video but downscale it to 720p for display. On the processor page, it indicates 800MHz, but you seem to be right as after a google search shows there are a few tablets with this CPU clocked at 1 GHz. Mali 200. OK. I knew there was a GPU inside the WonderMedia, but I was not sure which one. I don’t really mind having NAND flash or not that much, so the flash size would not be an issue personally. I was also disappointed by the power consumption. The Mele A1000 has a 10W power supply which can handle 1080p video decoding in a SATA drive. Yes, it’s not as good as the AllWinner a10 devices in terms of performance, but I have yet to find a sub 50 USB board for AllWinner A10. Hopefully, Hyston board will change that. I see it more as a competitor to the Raspberry Pi, especially for people with VGA monitors, since they’d have to buy an HDMI monitor, an HDMI to VGA adapter or use it via composite. Some applications require some memory optimization for Raspberry Pi because of the 256 MB memory, the VIA PC is clearly at an advantage here. I must say I really like the VGA and HDMI on this board. CNX, your hardware spec says “15W power adapter”. Is it included? I don’t see it on http://apc.io/ If a PSU and a box (and a RC) have to be added (seriously adding to the cost), the Mele indeed is more interesting. Pity both devices are sold with Android 2.3; I have Android 4.0 on my tablet, and it feels much more grown up than Android 2.3. And as we know, Android 2.3 is designed for phones, not for tablets nor desktops. I got the 15 W Power Adapter thing in the Press Release http://apc.io/files/2012/05/PR120522-APC-Final.pdf.